I have written before (go to the last few paragraphs of that post and in particular the link) about the unlikely chains of events which which can bring matters before the courts. In the story below, I have changed some names, but basically it is a very lightly edited extract from a judgment. I have highighted in bold the dramatis personae on their first entry, to help you keep track of who’s who. Are you all sitting comfortably? Very well then, I’ll begin. Jacob Epstein began dealing in drugs while still at school. At the time of these events, he was 20 years old and this was his principal source of income. His area of business was Bondi and its neighbourhood. On 11 February 200x Epstein received a telephone call from Salah. Salah told Epstein that he wanted to meet him. Epstein agreed to meet him. At about 10.00 pm the next evening Epstein drove his father’s jeep to Bondi and waited outside a pizza shop on Bondi Road. Sabah was in the driver’s seat. Epstein got into the car and sat down next to him. Epstein noticed two large men standing in the vicinity of the service station. Salah drove the car to the service station. Salah asked Epstein what he sold and Epstein told him “mainly pot and a little bit of pills.” Salah said, “I run the eastern suburbs, nobody deals here without paying me rent”. The three vehicles proceeded to Queen’s Park. All the occupants of the cars got out. Epstein said that they marched him into the middle of the park “in the pitch black, the darkness”. He thought he was going to die. He was bashed repeatedly. He said:“I had guns pointed at my head. … – they made me kneel down, I had a gun to my forehead and a gun to the back of my head, and then they demanded money”. While he was so kneeling on the ground with the guns pointed at him, Salah was in front of him, about one metre away. One of the men said:“You are going to give us 50 grand.”Another said:“If you run, we’ll shoot you down”. Epstein was then asked where certain specific assets belonging to him were. He responded by saying they had been sold, or lost in a fire or stolen. He was asked about the jeep and said that it was under finance. He was then hit again. One of the men said:“I’m going to enjoy killing you … I’m Palestinian, do you know what we do to Jews”. Salah then asked Epstein where his money was and Epstein said that he was owed a lot of money. He proffered the names of a number of people including one Stephen Kelly. At about this stage, Danny Goldstein, a school friend of Epstein , rang on Epstein ‘s mobile telephone and told Epstein that he had $150 for Epstein to pick up. Goldstein was indebted to Epstein for gambling and purchases of marijuana. Epstein proceeded to make at least three telephone calls but none was fruitful. Sirens were heard in the distance. Epstein was grabbed by the shirt and the men ran towards Queen’s Park Road. They collected the three vehicles. Epstein got into the back of the jeep, which Salah drove. Epstein directed the appellant to Kelly’s flat. Kelly had been living with a friend who had returned to Ireland. Kelly owed Epstein $120 and his friend owed Epstein $1,000. The men entered Kelly’s flat. They told him that he owed money. Kelly commenced to shake. Epstein told him to pay the money he owed to “these guys”. Kelly pulled $200 out of his wallet and gave it to one of the men. He was then shaking badly. Kelly made some reference to getting money from a bank. The men returned to the vehicles with Kelly accompanying them. The men drove to a Westpac Bank automatic teller machine in Belmore Road, Randwick. There, Salah and Kelly left the vehicle. Kelly was able to use his Commonwealth Bank key card and after a number of attempts (because he attempted to withdraw amounts over his limit) withdrew $500 was successfully withdrawn from the account. Kelly then left and Epstein was driven to a Commonwealth Bank ATM. The appellant told him to withdraw money, using his credit card. Epstein withdrew $700 (his limit) and handed over the money. Eventually the three vehicles drove to Goldstein’s house. On the way the appellant asked Epstein how much money Goldstein owed him and Epstein replied “$950” When they arrived outside Goldstein’s house, Goldstein approached the jeep in which Epstein was sitting and handed him $150. Goldstein was told to get in the vehicle and he did so. Goldstein was then asked for “the rest” of the money. Goldstein asked Epstein how much more he owed and Epstein said “another 800.” Goldstein was asked when he would produce the $800. Goldstein replied, “probably within a week or two”. He was told, however, that it had to be done “that night”. One of the men asked Goldstein for his jewellery. Goldstein refused to give it to him but the man took it off him. The jewellery comprised a chain with a pendant, a bracelet and a ring that he was wearing on his little finger. All the jewellery was made of gold. Goldstein also handed over his wallet. The men looked through the wallet and returned it. There was no money in it. The man sitting on Goldstein’s side then told him to hand over his mobile telephone. Goldstein complied with this instruction. He did not get the telephone back. According to Epstein , whilst sitting in the car, Goldstein “put his head down towards his lap” and “groaned”. After Goldstein was told to get the additional money, he made a telephone call. The group drove on to Epstein’s house in Kensington. He had told the men that he had $1,000 to $2,000 in cash at his home. On the way he telephoned his younger brother, Danny. He told Danny to get “all the money” out of the right hand pocket of their mother’s fur coat. Unbeknown to Epstein and his brother, their mother had removed the $2,000 from the right pocket but there was $10,000 in the left pocket. Danny thought the $10,000 was the money that he should bring, and did so. Epstein told Danny to walk to the jeep at the end of the street, hand the money to him and walk away. Danny did more. He handed Epstein a box that contained approximately 1,200 blue ecstasy tablets as well as the $10,000. Epstein handed the box to the appellant who retained the contents. In the meantime, Sheslow (who was a friend of Goldstein and Epstein) had been telephoned by Goldstein. By now it was after midnight. After receiving the call, Sheslow drove one Danny Spiecer (who had also received a call from Goldstein) and Daniel Aron (who had received a call from Sheslow) to an ATM in Rose Bay. There, the three men withdrew about $800 which Sheslow kept. An arrangement was then made by telephone for Sheslow to deliver the money so withdrawn to Goldstein, outside Goldstein’s home. Goldstein was still in the jeep with Epstein and the other men. The three men proceeded to Goldstein’s home in Sheslow’s car. When Sheslow saw Epstein ‘s vehicle he drove slowly past it and, without stopping, stretched out his arm and passed the money to Goldstein who was seated in the right rear passenger seat. Sheslow kept driving and turned his headlights off to ensure that he was not followed. He could not see well because of the time of night and the lighting. Nevertheless, he said that when he passed the money to Goldstein he noticed that he looked as if he had been crying, as did Epstein . After receiving the money from Sheslow, the appellant asked Goldstein if family was important to him and said:“If you go to the police your family is dead.”Goldstein was then released, having been in the car for an hour to an hour and a half. His jewellery was returned, but not his telephone. On one of the occasions Goldstein was slapped, one of the men in the car said:“He’s here to pay a debt, leave him alone”. Epstein ‘s right eye was bruised, his left eye was sore and he had bruises on his head. He did not seek medical attention for any of his injuries. So, how did Danny manage to accidentally hand over all those pills? What was this thing with the family all hiding money in mum’s fur coat? Where did Danny get the box with the pills from? Was it, too, in the fur coat? (We all know about “Lucy in the Sky with Diamonds.” Does this suggest a fresh reading of The Lion the Witch and the Wardrobe?) Did Epstein bring this whole thing down on himself by not paying his creditors on time or not monitoring his receivables with sufficient care? And who squealed? It doesn’t look as though Epstein was likely to want to tell the police about this. For what it’s worth, my own guess is that the police caught someone with the pills or maybe there was some incident involving the jeep (it’s not clear whether that was given back to Epstein), and the trail led back either via Salah directly to Epstein, who then told the story and went crown evidence either to save his skin orto get a reduced sentence. I know it is heartless of me, but I find parts of this story pretty funny. In a couple of places the humour arises because of some details in the story have been left out. Perhaps it lacks dramatic structure, but I can’t help thinking it would make a good film or telemovie. Knowing the places where these events occurred also adds a certain picquant charm. Luckily, no-one was seriously hurt on this occasion. The threat was all, provided it produced results, that is. In fact, the honour-amongst-thieves element (ie, the solicitude, probably part of a good-thug-bad-thug routine, shown for Goldstein by one of the standover men) is almost touching. Anti-drugs crusaders are inclined to cite this sort of drug-related crime as further proof of the evil of drugs. My own feeling is that the argument goes the other way. It’s the law of the jungle out there because of the laws against drugs. The accusations against international pharmaceutical companies are many, but they mostly deal in inducements rather than threats, and you don’t find many pharmacists having this sort of problem with their suppliers or would-be suppliers. Further afterword, 2013: “Epstein,” his brother and his mother moved to St Ives. As they were subsequently all convicted of either cultivation or supply I suppose they cannot be harmed if I mention that you can read the original of this “true story” in the judgment of the Court of Criminal Appeal hereor here. Yesterday I read an unusually brisk judgment ordering a caveator to withdraw a caveat and pay compensation, given by Justice Brereton in the NSW Supreme Court. You may or may not know that Australia’s main contribution to legal history is “Torrens Title,” named for the nineteenth-century South Australian politician after whom Adelaide’s Torrens River is also named. This is a system of registration of land ownership which was conceived in order to do away with the cumbersome and expensive system of land title which the white man brought to Australia from England, where in order to prove ownership of land you had to establish title in the land through the series of documents which indicated all the dealings with the land which went right back to some document which could be considered a good “root of title.” Any weak link in this chain of title could cause the whole process to unravel (yes, mixed metaphor) and lead to lengthy and expensive delays and disputes. The key principal of Torrens Title is the existence of a register, maintained by the government, which records interests (ie, property rights) in land. The state in effect guarantees these interests because the law considers them to be indefeasible. There is an important exception to this indefeasibility, in that, broadly speaking, an interest in land is subject to the rights that other parties may have against the owner of the land, for so long as the owner remains the owner, but a person who deals with that owner or receives the land from that owner without knowledge of such interests will normally take their interest in the land free of any such hidden interests. Some interests in right are created by statute or by planning schemes, and these are then recorded on the register. However, most rights are created by the owner of the land. The owner of the land is issued with a certificate of title, and the interests which the owner creates (such as, for example, a mortgage) are registered by production to the government office of the paperwork in relation to the creation of that interest, together with the certificate of title. However, it is still possible (and indeed, quite common) to have an interest in land which is not registered, either because the owner is unable to produce the certificate of title to the register to enable registration of your interest (for example, when a person borrows money from a bank or other financial insitution, as well as registering its mortgage, the bank will hold on to the certificate of title until the mortgage has been discharged) or because the registered owner does not co-operate in producing the certificate of title for this purpose together with the necessary paperwork appropriately signed by the registered owner. Sometimes there will in fact be no paperwork, because the owner does not agree that the other party has an interest in the land, and/or the owner has not executed a document which could lead to the registration of that interest. Obviously, the holder of such an unregistered interest (or claimed interest) is vulnerable to the owner’s interest being transferred to a third party who doesn’t know about that interest, and who will consequently acquire an indefeasible title in the land. If that happens, the unregistered interest in the land will have disappeared. You might be able to sue someone about this, but if they don’t own the land any more, not only will you have lost the interest in the land, but you may well face difficulties in getting any money from them as compensation. To guard against this risk, you can lodge a caveat which will be recorded in the register. You don’t need to produce the Certificate of Title to do this, and it doesn’t require the consent of the registered owner or of the holders of other registered interests. While the caveat remains on the register, no further dealing can be registered which is inconsistent with the interest claimed in the caveat. The word caveat comes from the latin “to warn,” but the practical effect of a caveat is rather more than this, since it will generally block any dealings with the land. This could be very inconvenient for registered owners or other parties wishing to deal with their interests. For example, if they have entered into a contract to sell the land and are unable to do so, they could face claims for damages as a result. They may also face losses as a result of the funds which they were expecting from such a transaction no longer being available so that, for example, they are unable to buy another property and may be facing contractual damages claims for that. Obviously, then, the lodging of a caveat can be a very powerful spoiling tactic in any dispute between people where one side has property over which such a caveat can be lodged. In such cases, the person whose interest is, in effect, blocked by the caveat can issue a lapsing notice to the person who has lodged the caveat. The effect of this lapsing notice is that the caveat will lapse (that is, cease to be recorded) after (in NSW, at least) 21 days unless the caveator obtains a court order extending its operation. To do this, the caveator has to commence proceedings which will ultimately result, if the caveator is successtul, in establishing the caveator’s right to the interest in the land. The first step in these proceedings will then involve a decision to determine whether the caveator’s claim is sufficiently strong that the owner’s interest in the land should continue to be blocked by the caveat until the claim can be litigated in the proceedings. Other considerations at this time will also include the balance of convenience, that is, a weighing up of the likely harm to the caveator if the caveat should be removed and the likely harm to the person who owns the interest in the land if they are unable to deal with it in the interim. Because the order has to be made in 21 days, this step is taken urgently. Caveators don’t have to prove their case fully, but they have to do more than simply assert their claim. Because it is urgent, the question usually comes before a duty judge to be decided at relatively short notice, and often at the last minute so that, if an order is obtained, the caveator can get the necessary paper work and rush across the road to the government department which maintains the register before it closes on the last day. This urgency gives the proceedings a certain subdued air of drama compared to the usual leisured majesty of the law. Such applications are relatively commonplace. It is easy to lodge a caveat, and lots of people have interests in land. My guess is that these applications are one of the three most commonly-litigated types of matters heard in the Supreme Court, the other two being applications to set aside statutory demands (statutory demands are a way of shaking down a company for money by issuing a demand for a debt which, if not satisfied, can establish that a company is insolvent and lead to it being wound up) and applications for security for costs (this is when a defendant says that the plaintiff must provide some money or other security upfront to the defendant because if the defendant wins there is a risk that the defendant will whistle in the wind to recover the defendant’s legal costs from the plaintiff). There is a forest of case law about all three of these, or rather, there would be forests, had they not been cut down to print the paper on which the decisions are printed. I mentioned already that lodging a caveat can be a very powerful spoiling tactic. If the caveat was wrongy lodged, you can seek compensation against the caveator. This is rare, because usually the question about extension of the caveat hinges on the strength of the caveator’s claim, or whether the balance of convenience favours its extension or not. Whether or not the caveat was really justified will often disappear in the wash when, after the initial stoush, the parties settle their differences out of court. In this case, a solicitor was engaged to prepare, and did prepare, a contract of sale for a property. The solicitor seems to have acted for both sides (purchaser and vendor) in doing so, and performed some other associated work. The parties then changed solicitors, and a fresh contract was entered into which then proceeded to completion. The first solicitor’s fees were not paid. Shortly before the proposed settlement of that contract (that is, the final point where monies are exchanged and the certificate of title handed over for transfer of registration to the new owner) the original solicitor lodged a caveat claiming an “equitable interest” by virtue of “exchange contract of sale of the subject property dated 19 November 2006” (that is, the contract which the first solicitor had prepared). He said he would withdraw the caveat if his fees (which he said were owed by the owner) and other monies (owed by various parties associated by the purchaser) were paid. The owner of the land did not wait for the usual lapsing notice procedure to run its course. He went straight to the court and sought an order that the caveat be removed and that the solicitor pay him compensation for the loss caused by the delay. The proceedings were brought on for hearing the very next day. Justice Brereton took a very dim view of the solicitor’s conduct. This amount was the loss caused by the delay in the settlement. It is not a particularly large amount, and would normally not be the sort of thing with which judges of the Supreme Court would be concerned. Obviously, however, there was a principle at stake. Usually, unsuccessful litigants are only ordered to pay the other side’s costs “as agreed or assessed.” If the costs are assessed by the court on this basis, in most cases the successful party is only entitled to recover about 75% to 80% of their actual costs, if that. An indemnity costs order, although it may still need to be assessed, is one which entitles the party in whose favour it is ordered to recover 100% of the party’s costs. Such orders are only made against parties who have behaved unreasonably or really badly. It is rare and therefore oddly cheering to see justice so swiftly and decisively done. This sentiment may be tempered by the thought that, although he went too far in lodging the caveat, the solicitor may well have been dudded by his clients in relation to money owed by them to him. The latest orders made under this legislation are reported in the press here. See also my previous post. Pending final determination of the application, Mr Tillman is now subject to a series of rolling detention orders, although at least the plan at present is that the Attorney-General’s application for a 5-year detention order will be heard within the period of the next 28 days, though obviously not necessariy determined. Two aspects of the application ring a particularly grim note. First, the crown argued that, once an interim detention order had been made, the court only had the power to make a further detention order – that is, it could not decide that in fact an interim supervision order would be sufficient would suffice. Secondly, for the period Tillman had been let out on a supervision (the first judge who heard the application considered that this would be sufficient and Tillman spent some time at large under supervision until the Court of Appeal reversed this decision and put him back inside) he was subject to particularly rigorous physical surveilance. One would have thought that the capacity of the government to undertake such supervision would have been relevant to the question of whether supervision, as opposed to detention, was an appropriate approach. That’s right. The man is locked up because Corrective Services won’t tell the court and therefore the court doesn’t know what steps (beyond the conditions which could be imposed by the court on the applicant) the department could (or would) take so that supervision might in fact be adequate to prevent him from reoffending in the interim period. Fisher Library – the death of the book? On Sunday I went to Fisher Library. As a University of Sydney graduate, I am able to borrow from the university libraries on payment of an annual fee of about $80. It is good value. In the city, I use the law school library and the Conservatorium Library. I get to Fisher less often. That scintillating title was for my work. Can you detect a theme there? I owe that to Miranda Devine (and here). I have a long and indeed familial connexion with libraries. My mother’s Aunty Malvina (in fact, I think, the sister-in-law of one of her aunts) was the first Australian female university librarian, at the University of Western Australia, where she was librarian for over 30 years. My step mother and my paternal aunt both trained as librarians under her. My mother and her sister were both teacher-librarians. Fisher Library was divided into two main collections. The Research Collection, housed in the tall metal-clad “stack” at the southern end of the building, was the main collection. The name “stack” did not refer (though at first I think I thought it did) to the shape of the building, but to the fact that, up to the year before I started at the university, it was not generally an open-access collection. Ordinary borrowers had to fill in slips which where dispatched to the respective floors by pneumatic tube and wait for the books to be brought down. The vestiges of these tubes remained for many years, though I forgot to check last Sunday whether they are still there. The lower-lying northern wing of the library housed the “Undergraduate” collection. Call numbers were all prefixed by “U.” This was the teaching collection. It included multiple sets of often-used books, and books borrowed on this side could only be borrowed for a week. I conducted my first searches on Sunday in the stack. As closing time was approaching, I took my choices to the loans desk and effected the transaction. This was the first change: no longer is the due date stamped on the return slip at the back of the book; you are given a printout of the books you have borrowed. Actually, I had experienced this already in the city branches but hadn’t quite realised it. With time to spare, I then wandered over to the undergraduate collection for a little browse. The entrance floor and foyer are on level 3, and on the northern side this also houses an AV and microfiche collection, as well as the catalogue computer area, the reference collection and the periodicals room. I headed down a level, according to my (lower number Dewey Decimal) chosen browsing range. I went down another floor, and still there was no undergraduate collection. Here its place seemed to have been taken by a separate “Curriculum Resources” collection – formerly resident within the Faculty of Education. Finally, I found the old Undergraduate collection, renamed “short loan collection” on level 4. It seemed considerably truncated. I guess that photocopied course materials and changes in the subject matter taught in the subjects which are covered in this particular undergraduate collection (some faculties still have their own undergraduate borrowing collections) had led to a bit of a spring clean as well as a purging of some of the multiple copies. It is a sad fact (even if understandable) that there seems to be nothing a modern librarian enjoys so much as throwing out books. I felt like Rip van Winkle. I forgot to look to see if the old sign, prohibiting the wearing of stilleto heels smaller than a 10 cent coin (to protect the linoleum) was still to be found at the front entrance. There are still plenty of books, but it was hard to escape the feeling that the writing is on the wall. Speaking of which, I forgot to see if the walls of the men’s toilets on the odd-numbered floors in the stack still bore their old mixture of appeal and abuse. I expect times have moved on in that respect too. I have been a blog lurker and commenter for a long time. This blog finally sprang not-quite-fully-armed from More lines from a floating life, after Ninglun called for participants in a meme to disclose 8 random facts about themselves. As a non-blogger, I wasn’t really entitled to participate, but I did so anyway, by commenting on Dues Lo Volt. Exhausted after the triumph (it’s all relative) of my entry on Miranda and The History Boys, I have been forced to fall back on old material and repost my response here. I’ve wrestled with getting the photo to fit in the page properly, but that will need to await sage advice from somebody else (he knows who I mean) before I can put it to rights. So here goes. 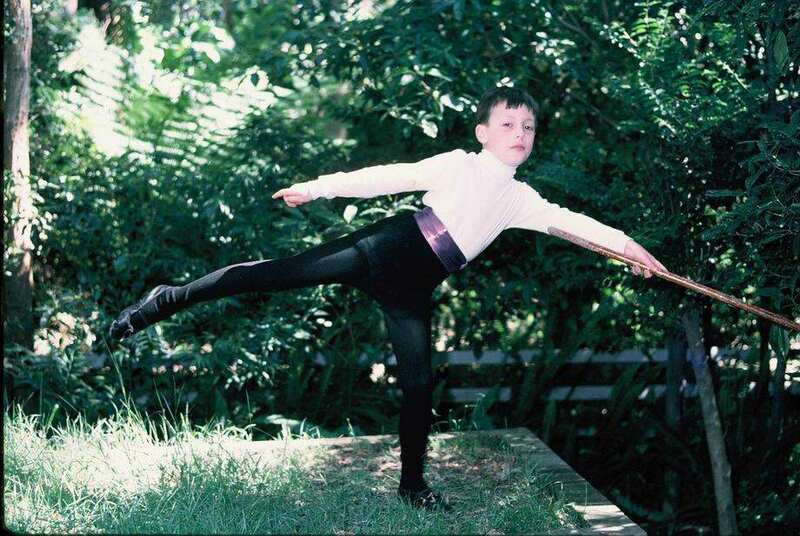 I learnt ballet for a couple of years as a child. There is a famous (in our family) photo of me in a white skivvy and black tights and purple cummerbund holding an arabesque, taken in our rather shady back yard, except that, allowing for the slow speed of colour slide film at that time, the shade and my sense of balance, I am actually supporting myself against a tree with a broom held in one hand. Note (rather indistinct in this version of the picture) the bruising on my left hand under the finger-nail – presumably from shutting some door or drawer on my fingers. I was a clumsy child. The ballet school was run by two sisters. The pianist was the husband of one of them, a man called Max Aronsten, now dead. He befriended me, and for many years after used to send me music for Christmas. In later years I sometimes visited him at Chappel’s office in the city, where he was a manager. I last saw him, briefly and in passing, at an eisteddfod in about 1985. I have since found out that he was a much more interesting character than simply a ballet school pianist or even music publisher. There is an interview with him in the oral history archives of ScreenSound Australia, but I doubt if I figure in it. Although I loved the music, I had no physical aptitude for the dance. I stopped doing ballet when I started piano lessons. In 1970 I won a children’s story-writing competition run by Puffin (ie, Penguin) Australia, and judged by Ivan Southall (the things authors need to do for a crust!). The prize was 50 Puffin books. I was allowed to take other Penguin imprints; I still have a few of those books today. The first third of my story was printed in the Australian and I was interviewed by Robert Drewe, who, tongue-in-cheek, imagined a future of literary awards for me. In fact, it was Robert Drewe who had such a future. In year 8 Geography, I proved unable to hand in my homework, and was given the lowest mark possible on the school computer report system: 30%. I was on a scholarship, and when things didn’t particularly improve by the next year, the headmaster threatened to take the scholarship away. Fortunately or not, this didn’t occur, and I managed to stay at the school until the end of year 12. In my teenage years I briefly learnt the cello. My first teacher was Henri Penn, once a pianist and accompanist of some renown on ABC broadcasts but by this time (obviously) fallen on rather harder times. In 1984, at the end of my history honours year at ANU, I arranged for all of my fellow students to make Freedom of Information requests for documents relating to our assessment. There was little reason for me to make such a request other than the trouble-making of youth, as I had been treated well. I have reason to believe that this act of ingratitude on my part backfired insofar as the unavailability of my file appears to have prevented an application for a scholarship at the Research School for Social Sciences being considered. I made the first request. The case appears in the textbooks, but not under my name, because of an anomaly in the university’s response to my request which meant that another student’s request became the lead case. I have performed in two productions of Benjamin Britten’s Noyes Fludde: first on the treble recorder (doubling handbells) and the second playing the piano duo primo part. In the first production, one of my handbells was defective and inclined to just click rather than ring; in the second, my left elbow was fouled by the secondo player’s right elbow at a crucial moment, and a leap down to the D just above middle C, which was a vital cue for a singer, came out as an E. The performance, recorded by ABC, was never broadcast. In 1994, after a whirlwind romance, a colleague and I proposed to marry. You had to fill in a form at the marriage registry which needed to be witnessed by an eligible person. As solicitors, we were both eligible persons, but the clerk baulked at our witnessing each other’s signatures. The woman in question called the whole thing off in the week it was due to occur. When I announced the impending marriage to a colleague, she said “but we all assumed you were gay,” to which I beamingly replied that I was a “closet heterosexual.” I have since retired (hurt?) from heterosexuality. This meme seems to have had quite a ripple effect. There have been some striking disclosures as well as some which, have apparently been regretted and consequently retracted. As almost everybody I know seems to have participated in this meme already (it obviously gratifies the bloggers’ rage for free-form self-disclosure) I won’t bother with inviting further participation, though, God knows, I would welcome practically any comment by anyone who wants to follow on. You are currently browsing the Stumbling on melons blog archives for May, 2007.